Veel mensen (vooral vrouwen en ouderen) hebben last van droge ogen. Dit geldt voor circa 6% van de mensen vanaf 40 jaar en 15% van de mensen boven 65 jaar. Verschillende natuurlijke ontstekingsremmers en antioxidanten kunnen klachten van droge ogen verlichten. Nakano T et al. Blink-related momentary activation of the default mode network while viewing videos. Proc Natl Acad Sci. USA. 2013;110(2):702-6. The definition and classification of dry eye disease: report of the Definition and Classification Subcommittee of the International Dry Eye WorkShop Ocul Surf. 2007;5(2):75-92. Wilson SE. Inflammation: a unifying theory for the origin of dry eye syndrome. Manag Care 2003;12(Suppl):14–9. Askeroglu U et al. Pharmaceutical and herbal products that may contribute to dry eyes. Plast Reconstr Surg. 2013;131(1):159-67. Alves M et al. Dry eye disease caused by viral infection: review. Arq Bras Oftalmol. 2013;76(2):129-32. Abe T et al. Decreased tear lactoferrin concentration in patients with chronic hepatitis C. Br J Ophthalmol 1999;83:684–687. Wei Y et al. The core mechanism of dry eye disease is inflammation. Eye Contact Lens. 2014;40(4):248-56. Luo L et al. Experimental dry eye stimulates production of inflammatory cytokines and MMP-9 and activates MAPK signaling pathways on the ocular surface. Invest Ophthalmol Vis Sci 2004;45:4293-301. Preedy VR ed. Handbook of nutrition, diet, and the eye. Elsevier, 2014;169-175. ISBN: 9780124017177. Dogru M et al. Lactoferrin in Sjögren's syndrome. Ophthalmol. 2007;114(12):2366-7. Zheng Q et al. Reactive oxygen species activated NLRP3 inflammasomes initiate inflammation in hyperosmolarity stressed human corneal epithelial cells and environment-induced dry eye patients. Exp Eye Res. 2015;134:133-40. Abengózar-Vela A et al. Quercetin and resveratrol decrease the inflammatory and oxidative responses in human ocular surface epithelial cells. Invest Ophthalmol Vis Sci. 2015;56(4):2709-19. Baudouin C et al. Role of hyperosmolarity in the pathogenesis and management of dry eye disease: proceedings of the OCEAN group meeting. Ocul Surf. 2013;11:246-258. Miljanovic B et al. Relation between dietary n-3 and n-6 fatty acids and clinically diagnosed dry eye syndrome in women. Am J Clin Nutr. 2005;82:887-893. Walter SD et al. ω-3 tear film lipids correlate with clinical measures of dry eye. Invest Ophthalmol Vis Sci. 2016;57(6):2472-8. Liu A et al. Omega-3 essential fatty acids therapy for dry eye syndrome: a meta-analysis of randomized controlled studies. Med Si Monit. 2014;20:1583-1589. Macsai MS. The role of omega-3 dietary supplementation in blepharitis and meibomian gland dysfunction (an aos thesis). Trans Am Ophthal Soc. 2008;106:336-356. Andrade AS et al. Alpha-lipoic acid restores tear production in an animal model of dry eye. Exp Eye Res. 2014;120:1-9. Li Z et al. Effects of eye drops containing a mixture of omega-3 essential fatty acids and hyaluronic acid on the ocular surface in desiccating stress-induced murine dry eye. Curr Eye Res. 2014;39(9):871-8. Rashid S et al. Rachid S et al. Topical omega-3 and omega-6 fatty acids for treatment of dry eye. Arch Ophthalmol. 2008;126(2):219-25. Erdinest N et al. Anti-inflammatory effects of alpha linolenic acid on human corneal epithelial cells. Invest Ophthalmol Vis Sci. 2012;53(8):4396-406. Kohli P et al. Resolvins and protectins: mediating solutions to inflammation. Br J Pharmacol. 2009;158(4):960-971. Viau S et al. Efficacy of a 2-month dietary supplementation with polyunsaturated fatty acids in dry eye induced by scopolamine in a rat model. Graefes Arch Clin Exp Ophthalmol. 2009;247(8):1039-50. Gaby AR. Nutritional therapies for ocular disorders: part three. Altern Med Rev. 2008;13(3):191-204. Flanagan JL et al. Role of lactoferrin in the tear film. Biochimie. 2009;91(1):35-43. Devendra J et al. Effect of oral lactoferrin on cataract surgery induced dry eye: a randomised controlled trial. J Clin Diagn Res. 2015;9(10):NC06-9. Careba I et al. Tear lipocalin, lysozyme and lactoferrin concentrations in postmenopausal women.J Med Life. 2015;8 Spec Issue:94-8. Williams JE. Portal to the interior: viral pathogenesis and natural compounds that restore mucosal immunity and modulate inflammation. Alt. Med Rev. 2003;8(4):395-409. Ubels JL et al. Vitamin A is present as retinol in the tears of humans and rabbits. Curr Eye Res 1984;3:815-22. Nakamura S et al. Delphinidin 3,5-O-diglucoside, a constituent of the maqui berry (Aristotelia chilensis) anthocyanin, restores tear secretion in a rat dry eye model. J Functional Foods 2014;10:346-354. Hitoe S et al. MaquiBright™ standardized maqui berry extract significantly increases tear fluid production and ameliorates dry eye-related symptoms in a clinical pilot trial. Panminerva Med. 2014;56(3 Suppl 1):1-6. Chen M et al. Curcumin protects against hyperosmoticity-induced IL-1beta elevation in human corneal epithelial cell via MAPK pathways. Exp Eye Res. 2010;90:437-443. Higuchi A et al. Selenium compound protects corneal epithelium against oxidative stress. PLoS One 2012;7:9:e45612. Huang JY et al. A randomized, double-blind, placebo-controlled study of oral antioxidant supplement therapy in patients with dry eye syndrome. Clin Ophthalmol. 2016;10:813-20. Galbis-Estrada C et al. A metabolomic approach to dry eye disorders. The role of oral supplements with antioxidants and omega 3 fatty acids. Mol Vis. 2015;21:555-67. Drouault-Holowacz S et al. Antioxidants intake and dry eye syndrome: a crossover, placebo-controlled, randomized trial. Eur J Ophthalmol. 2009;19(3):337-42. Oleñik A. Effectiveness and tolerability of dietary supplementation with a combination of omega-3 polyunsaturated fatty acids and antioxidants in the treatment of dry eye symptoms: results of a prospective study. Clin Ophthalmol. 2014;8:169-76. Blades KJ et al. Oral antioxidant therapy for marginal dry eye. Eur J Clin Nutr. 2001;55:589-597. 1. Nakano T et al. Blink-related momentary activation of the default mode network while viewing videos. Proc Natl Acad Sci. USA. 2013;110(2):702-6. 2. The definition and classification of dry eye disease: report of the Definition and Classification Subcommittee of the International Dry Eye WorkShop Ocul Surf. 2007;5(2):75-92. 4. Wilson SE. Inflammation: a unifying theory for the origin of dry eye syndrome. Manag Care 2003;12(Suppl):14–9. 5. Askeroglu U et al. Pharmaceutical and herbal products that may contribute to dry eyes. Plast Reconstr Surg. 2013;131(1):159-67. 6. Alves M et al. Dry eye disease caused by viral infection: review. Arq Bras Oftalmol. 2013;76(2):129-32. 7. Abe T et al. Decreased tear lactoferrin concentration in patients with chronic hepatitis C. Br J Ophthalmol 1999;83:684–687. 8. Wei Y et al. The core mechanism of dry eye disease is inflammation. Eye Contact Lens. 2014;40(4):248-56. 9. Luo L et al. Experimental dry eye stimulates production of inflammatory cytokines and MMP-9 and activates MAPK signaling pathways on the ocular surface. Invest Ophthalmol Vis Sci 2004;45:4293-301. 10. Preedy VR ed. Handbook of nutrition, diet, and the eye. Elsevier, 2014;169-175. ISBN: 9780124017177. 11. Dogru M et al. Lactoferrin in Sjögren's syndrome. Ophthalmol. 2007;114(12):2366-7. 12. Zheng Q et al. Reactive oxygen species activated NLRP3 inflammasomes initiate inflammation in hyperosmolarity stressed human corneal epithelial cells and environment-induced dry eye patients. Exp Eye Res. 2015;134:133-40. 13. Abengózar-Vela A et al. Quercetin and resveratrol decrease the inflammatory and oxidative responses in human ocular surface epithelial cells. Invest Ophthalmol Vis Sci. 2015;56(4):2709-19. 14. Baudouin C et al. Role of hyperosmolarity in the pathogenesis and management of dry eye disease: proceedings of the OCEAN group meeting. Ocul Surf. 2013;11:246-258. 15. Miljanovic B et al. Relation between dietary n-3 and n-6 fatty acids and clinically diagnosed dry eye syndrome in women. Am J Clin Nutr. 2005;82:887-893. 16. Walter SD et al. 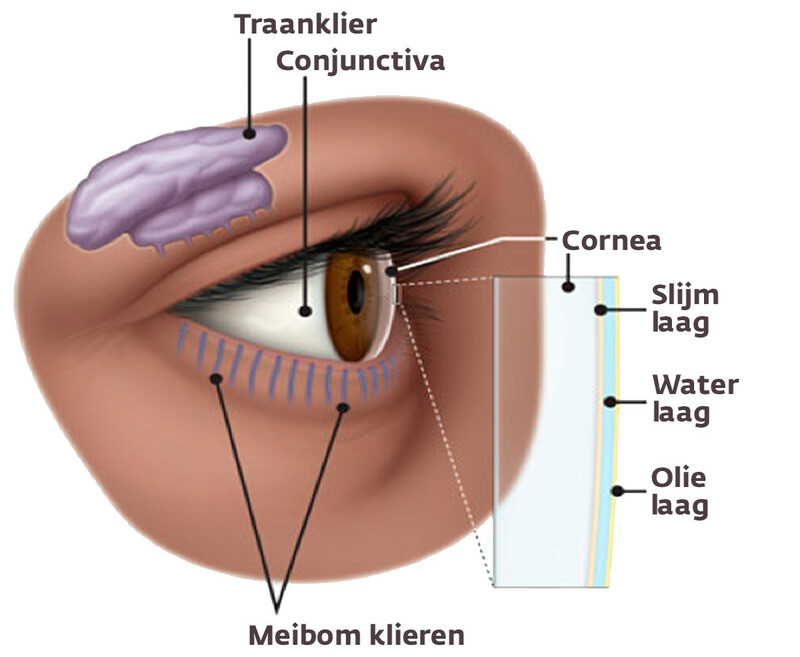 ω-3 tear film lipids correlate with clinical measures of dry eye. Invest Ophthalmol Vis Sci. 2016;57(6):2472-8. 17. Liu A et al. Omega-3 essential fatty acids therapy for dry eye syndrome: a meta-analysis of randomized controlled studies. Med Si Monit. 2014;20:1583-1589. 18. Macsai MS. The role of omega-3 dietary supplementation in blepharitis and meibomian gland dysfunction (an aos thesis). Trans Am Ophthal Soc. 2008;106:336-356. 19. Andrade AS et al. Alpha-lipoic acid restores tear production in an animal model of dry eye. Exp Eye Res. 2014;120:1-9. 20. Li Z et al. Effects of eye drops containing a mixture of omega-3 essential fatty acids and hyaluronic acid on the ocular surface in desiccating stress-induced murine dry eye. Curr Eye Res. 2014;39(9):871-8. 21. Rashid S et al. Rachid S et al. Topical omega-3 and omega-6 fatty acids for treatment of dry eye. Arch Ophthalmol. 2008;126(2):219-25. 22. Erdinest N et al. Anti-inflammatory effects of alpha linolenic acid on human corneal epithelial cells. Invest Ophthalmol Vis Sci. 2012;53(8):4396-406. 23. Kohli P et al. Resolvins and protectins: mediating solutions to inflammation. Br J Pharmacol. 2009;158(4):960-971. 24. Viau S et al. Efficacy of a 2-month dietary supplementation with polyunsaturated fatty acids in dry eye induced by scopolamine in a rat model. Graefes Arch Clin Exp Ophthalmol. 2009;247(8):1039-50. 25. Gaby AR. Nutritional therapies for ocular disorders: part three. Altern Med Rev. 2008;13(3):191-204. 26. Flanagan JL et al. Role of lactoferrin in the tear film. Biochimie. 2009;91(1):35-43. 27. Devendra J et al. Effect of oral lactoferrin on cataract surgery induced dry eye: a randomised controlled trial. J Clin Diagn Res. 2015;9(10):NC06-9. 28. Careba I et al. Tear lipocalin, lysozyme and lactoferrin concentrations in postmenopausal women. J Med Life. 2015;8 Spec Issue:94-8. 29. Williams JE. Portal to the interior: viral pathogenesis and natural compounds that restore mucosal immunity and modulate inflammation. Alt. Med Rev. 2003;8(4):395-409. 30. Ubels JL et al. Vitamin A is present as retinol in the tears of humans and rabbits. Curr Eye Res 1984;3:815-22. 31. Nakamura S et al. Delphinidin 3,5-O-diglucoside, a constituent of the maqui berry (Aristotelia chilensis) anthocyanin, restores tear secretion in a rat dry eye model. J Functional Foods 2014;10:346-354. 32. Hitoe S et al. MaquiBright™ standardized maqui berry extract significantly increases tear fluid production and ameliorates dry eye-related symptoms in a clinical pilot trial. Panminerva Med. 2014;56(3 Suppl 1):1-6. 33. Chen M et al. Curcumin protects against hyperosmoticity-induced IL-1beta elevation in human corneal epithelial cell via MAPK pathways. Exp Eye Res. 2010;90:437-443. 34. Higuchi A et al. Selenium compound protects corneal epithelium against oxidative stress. PLoS One 2012;7:9:e45612. 35. Huang JY et al. A randomized, double-blind, placebo-controlled study of oral antioxidant supplement therapy in patients with dry eye syndrome. Clin Ophthalmol. 2016;10:813-20. 36. Galbis-Estrada C et al. A metabolomic approach to dry eye disorders. The role of oral supplements with antioxidants and omega 3 fatty acids. Mol Vis. 2015;21:555-67. 37. Drouault-Holowacz S et al. Antioxidants intake and dry eye syndrome: a crossover, placebo-controlled, randomized trial. Eur J Ophthalmol. 2009;19(3):337-42. 38. Oleñik A. Effectiveness and tolerability of dietary supplementation with a combination of omega-3 polyunsaturated fatty acids and antioxidants in the treatment of dry eye symptoms: results of a prospective study. Clin Ophthalmol. 2014;8:169-76. 39. Blades KJ et al. Oral antioxidant therapy for marginal dry eye. Eur J Clin Nutr. 2001;55:589-597. 40. Gatell-Tortajada J. Oral supplementation with a nutraceutical formulation containing omega-3 fatty acids, vitamins, minerals, and antioxidants in a large series of patients with dry eye symptoms: results of a prospective study. Clin Interv Aging. 2016;11:571-8. Niet cholesterol maar homocysteïne is aartsvijand van het hart?